Our Liverpool branch has been looking after the painter decorators and homeowners of the city for almost 120 years. Originally part of the family-owned Robinson & Neal, joining the like-minded Brewers has extended our product range considerably. As always, service is our priority. We have an extremely well-informed and helpful team, happy to answer questions on all manner of decorating and product issues. 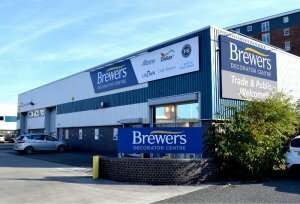 Our large showroom displays trade and designer paints, wallcoverings, fabrics and all the decorating equipment and sundries you’ll need. Any we don’t have, you can order into store from our customer internet terminal or from home. We’re easy to find too; next to Brunswick train station and almost directly opposite Brunswick Business Park. Wheelchair users and those with other mobility issues will be pleased to find we have dedicated disabled parking and the store is easily accessible for all. On Sefton Street, after the traffic lights, turn left. From Royden Way, at the roundabout, take the first exit on to Sefton Street, the store is a short way down the road on the right. From Riverside Drive, at the roundabout, take the second exit on to Sefton Street, the store is a short way down the road on the right.